NEW YORK (ForexNewsNow) – According to official Chinese media, Wen Jiabao is the first Chinese politician to openly express his concerns about the debt crisis in America and Europe. His comments come after a telephone conversation on Tuesday between Chinese Vice Premier Wang Qishan and U.S. Treasury Secretary Timothy Geithner. The conservation reflected the tensions, which have gradually been building between the two countries since the panic that hit stock markets in Asia on Tuesday. In contrast to the Chinese media, which has not hesitated in recent days to accuse the West, particularly the Americans, of living well beyond their means, China’s Prime Minister has refrained from pointing the finger at nations for the global economic downturn. But his choice of words are clear enough to be understood by all. The countries involved, said the head of the Chinese government, should adopt responsible monetary and fiscal policies to reduce their deficit and solve their debt problems, in order to allow the market to function in a secure and stable manner and to maintain investor confidence in the global economy. Investors have been reassured by the fact that the China’s central bank has not raised the reserve requirement, despite the rising inflation in the country. According to analysts, China’s central government is attempting to show its determination and confidence during the crisis, even though the top Chinese economic analysts remain pessimistic about the US’s ability to find a solution to their debt crisis. But many argue that the China of 2011 is no longer the China of 2008. The economic slowdown in the U.S. and Europe could result in a sharp drop in demand on Chinese export market, while Chinese domestic demand is not yet ready to take over. In addition, Beijing has their hands tied with inflation, which peaked at 6.5% in July. Therefore, unlike in 2008, China’s no longer can inject hundreds of billions of Yuan into the economy as it did during the Olympics. The Chinese authorities still greatly fear civil unrest and know that in order to maintain domestic stability they must slow down and stabilize their overheating economy. They also know that a new domestic stimulus package would only risk aggravating inflation and lead to more government debt, which is already burgeoning due to the collapse of the housing market. 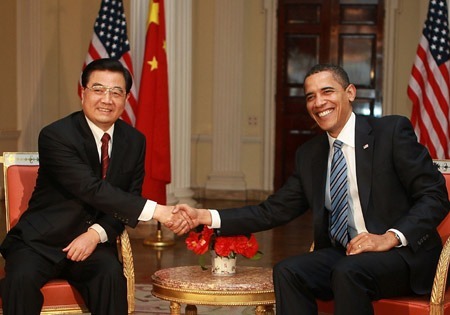 In many ways China currently occupies an awkward position in the global arena – on one hand the country directly benefits from the prosperity of the US economy, which boosts Chinese exports; but on the other hand it also benefits from the weakening of the US economy, which provides China’s with an opportunity to enhance its position as a rival superpower. Yet as one can see in this in depth analysis, China seems to lack the economic structure and the political stability needed to overtake the US as a global leader at this time.